And the first pickup for a new series this fall goes to — Fox‘s drama Sleepy Hollow. But instead of the standard back 9 order, the adventure series is getting a second-season renewal for at least 13 episodes. Sleepy Hollow is part of Fox’s strategy for shorter, largely uninterrupted, cable-style runs. It was designed to air its 13-episode first season in the fall before another drama series ordered under the same template, The Following, returns in the Monday 9 PM hour — likely in January. Given the success of Sleepy Hollow, it probably was tempting to try and extend its freshman season to the standard 22 episodes, but Fox brass stuck with their original plan. Alex Kurtzman and Roberto Orci, who co-created Sleepy Hollow with the pilot’s director Len Wiseman and Phillip Iscove but are now under an overall deal at CBS TV Studios, are on board for Season 2. Also coming back is Mark Goffman, who joined after the pilot as an executive producer assisting Kurtzman and Orci with showrunning duties. “The show has proven to be a risk well worth taking — it’s a conceptual blast unlike anything else on television and it all holds together with inventive writing and a fantastic cast,” said Fox chairman Kevin Reilly. Sleepy Hollow, a new take on the tale of the Headless Horseman, has been one of the biggest success stories this fall, not only because of its strong premiere numbers but because of its consistency, opening with a 3.4 18-49 rating and, three weeks in, still staying above the 3 ratings threshold in live viewing (3.0). The series, from K/O Paper Products and 20th Century Fox TV, also is a huge DVR draw, earning a 5.0/13 rating among adults 18-49 and 13.6 million viewers for the premiere in Live+3, making it Fox’s most successful fall drama premiere since the debut of 24 in November 2001. 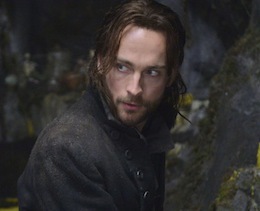 With its encore, post-three-day playback on DVR and VOD and streaming, the Sleepy Hollow premiere has drawn an audience of more than 22 million to date. The series is executive produced by Kurtzman, Orci, Wiseman, Goffman, series director Ken Olin and Heather Kadin, with Iscove serving as supervising producer.